These cherries take some patience, since they need to sit soaking up that sweet, vanilla flavoured bourbon for about four weeks. But the effort to reward ratio is minimal. And you end up with enough cherries to make many happy cocktails. 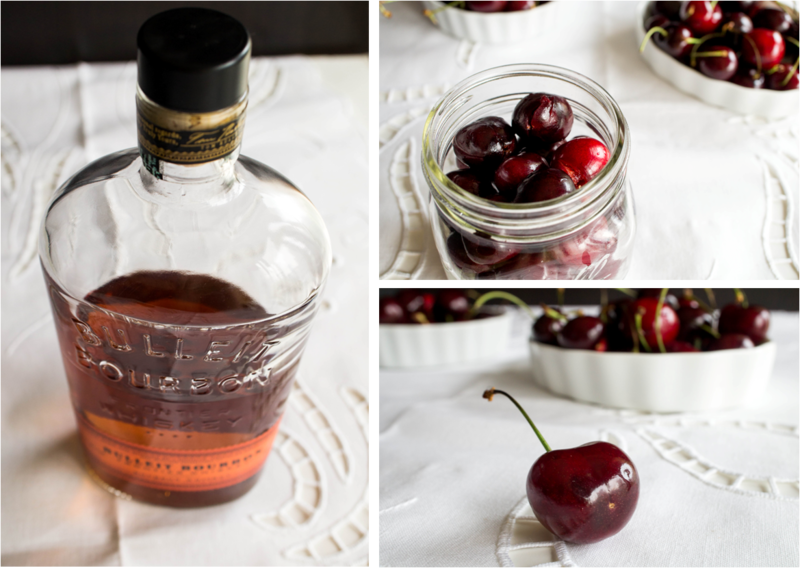 There’s nothing like finishing a cocktail with a sweet, juicy cherry. If cocktails aren’t your thing, I won’t judge you. 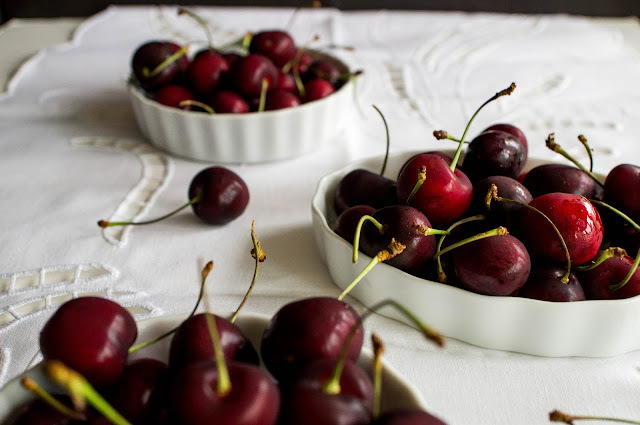 You could put these cherries on some vanilla ice cream. 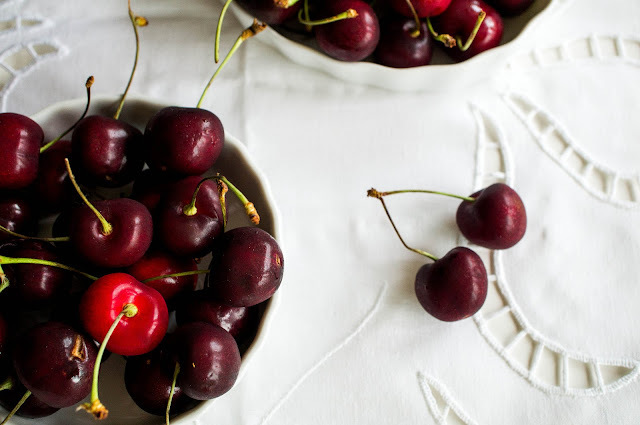 Sneaking a cherry out of the jar is allowed and encouraged. I won’t tell. When you make them, let me know and we’ll mix up a Manhattan or two. Wash and pit cherries. If you don’t have a cherry pitter, use a bottle and a chopstick. Place the cherry on the mouth of the bottle and push the chopstick straight down through it, pushing the pit into the bottle. Neat trick. 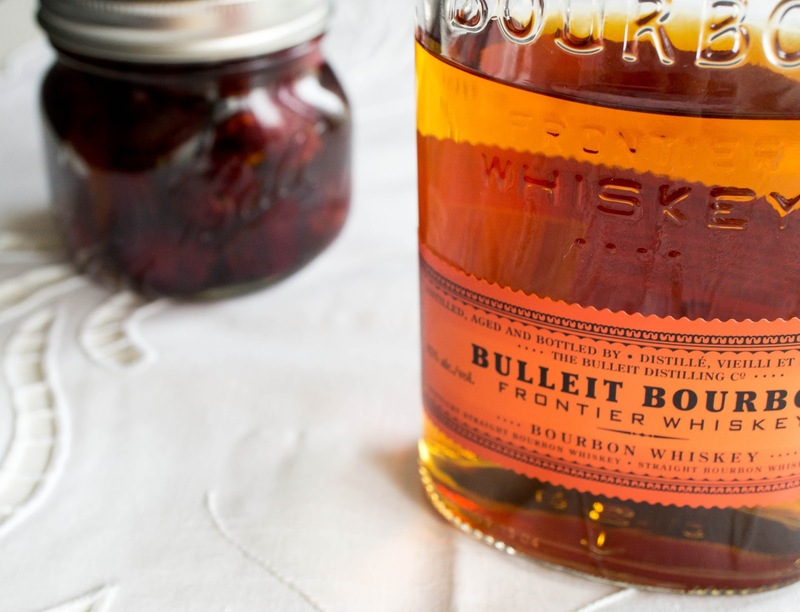 Place pitted cherries in a jar and cover with bourbon. In a small, non-stick skillet melt sugar. Watch it carefully because it will burn fast. As soon as sugar is melted, remove from heat and stir in vanilla. Pour syrup into prepared jar. Don’t worry if it hardens. It will dissolve again eventually. Screw the lid on tightly and give the jar a shake. Place in a cool dark place (mine are in the fridge) for about 4 weeks, shaking whenever you remember they are there. After 4 weeks, pop the lid open and enjoy your gourmet cherries in cocktails, on ice cream, or wherever you can think of.